The Village School opened in 1887 and closed in 1991. These images of the school, the children and the staff are from a variety of sources. Click on any image to see a larger version and use your computer’s scroll bars to move around it. Where known, the names of the children and the teachers are given on the larger version (apologies to all concerned for any mistakes in spelling or identification!). Any further details would be gratefully received and the item updated. Please feel free to submit any similar photos or sketches which you may have. Jennifer Dancer has kindly supplied this photograph of her great grandfather Albert Henry Smith, headmaster of Sulgrave School before and during the Great War 1914-18. 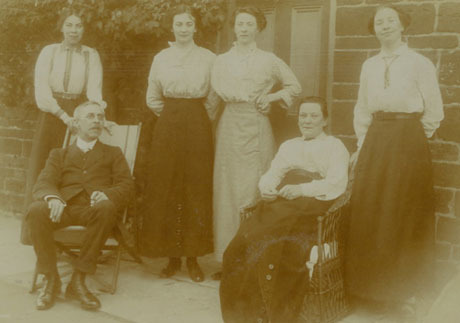 The photograph was taken in 1913 and shows him seated outside the School House with his wife Ellen (née Malin) and four daughters Helen Jessie, Dora Amy, Edith Abigail and Lilian. 1909 ? Henry Smith. Headmaster. c1921. The Cave family at the School. Photo: Unknown (courtesy Emma Cave). Photo: Unknown (courtesy Emma Cave)..
his 33 years as vicar of Sulgrave (1922 to 1955). Photo: Unknown (courtesy Carol Pirie). Mothers’ Day Service in the Church 1965. 1960s. School fete at the Vicarage. c1975. School Sports Day at Sulgrave House. The following photographs date from 1976/8 and were taken by the then headmaster, the late Jim Critchley and members of “Friends of Sulgrave School”. Village school headmaster Jim Critchley “in the stocks”. 1980. Victorian style May Day celebrations. 1980. Victorian style May Day celebrations. The handbell ringers. 1990. The year before the school finally closed.